I put away the ND1000 filter and set about finding new compositions. I used the 8mm and 50mm primarily. 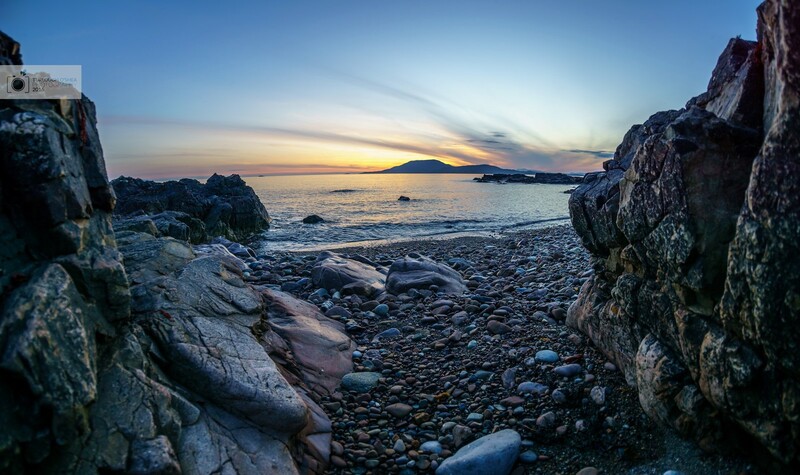 With the 50mm lens I attempted to shoot a panorama of Clare Island across the water. This took several shots and was much bigger. I cropped out a lot of the water as I felt it made the image a bit too big. I had an internal debate about this, however, as the water could have been seen as good use of negative space. I jumped down from the rocks next to the beach and found a recess that was between two rock formations. I thought that these would frame the image and Clare Island well. This image ended up better than I thought and was one of my favourites from the day.